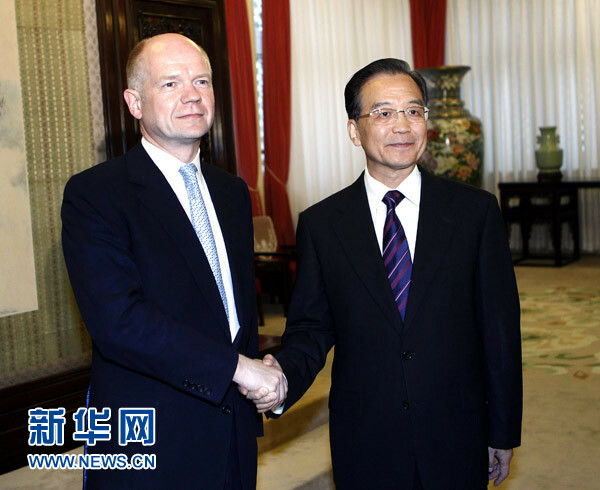 On July 14, 2010, Chinese Premier Wen Jiabao met with British Foreign Secretary William Hague in Ziguangge, Zhongnanhai. Wen said China appreciates the new British government for attaching great importance to developing ties with China. China is ready to work with the UK to maintain high-level exchanges, build up mutual trust and enhance cooperation in all areas with a long-term perspective and innovative thinking, so as to push forward China-UK comprehensive strategic partnership. Hague said Britain deems China its important partner for common development and the new British government will maintain the continuity of its China policy in a future-oriented attitude, make efforts to build a cooperative relationship for common growth and further strengthen strategic partnership with China. Foreign Minister Yang Jiechi and other officials attended the meeting.